The beauty mogul, Kim Kardashian, on an episode of Keeping Up with the Kardashians, barely two months after her last child and second daughter, Chicago, was born, tells her friend Larsa Pippen, that her husband wants more children, seven to be precise. Kim believes this is absolutely ridiculous especially in a crazy world like we live in. Other concerns besides her health, is raising children in a world where violence prevails. This isn’t especially easy for Kim as we know that while pregnant with North, who is now five, she developed pre-eclampsia and placenta accreta, which is a life threatening situation for mothers. During the birth of Saint, her first son and second child, she experienced labor complications. These likely contributed to why she chose a surrogate mom for her second daughter and third child, Chicago, in order to avoid another high risk pregnancy. Not to forget also is the control issue Kim and Kanye had over their chosen surrogate and Kim’s worries about how she would connect with her third child. We have a glimpse into what she could have been thinking when later on in the episode, Kim, Kanye, and North, attended the March For Our Lives rally to call for gun law reform after the mass shooting at Marjory Stoneman Douglas High School in Parkland, Florida. Kim talked about how traumatizing such situations are and how she has always advocated for better gun laws and gun control. Kanye’s desire to have more children isn’t exactly new. In Khloe Kardashian’s series Kocktails with Khloe in 2016, Kim said she was so set on her two kids and how happy she was with her life the way it was but that Kanye had been mentioning adding another kid to the ranks everyday for ten days straight. This was soon after the birth of Saint. Who knows maybe Kanye is aiming for spiritual perfection as Justin Bieber believes the number seven stands for. It seems that Kim and Kanye have trouble agreeing on the number of kids to have amongst all other things they apparently disagree on. But, I can’t say I don’t agree with Kim. Seven does seem ridiculous especially as training children isn’t all about being able to financially provide for them as much as it about making them grow up into responsible adults who can cope with life’s adversities and twists. 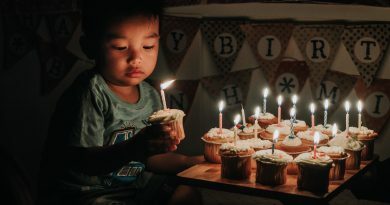 Find Out Interesting Facts About How Children From Different Countries Celebrate Their Birthdays! Are you earning more money than your spouse?